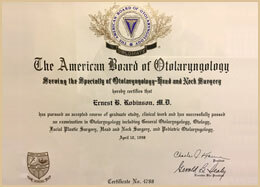 This notice describes the practices of Robinson Facial Plastic Surgery and the practices that will be followed by all of Robinson Facial Plastic Surgery workforce members who handle your medical information. 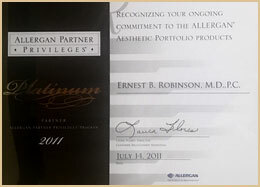 Robinson Facial Plastic Surgery understands that medical information about you and your health is personal. We are committed to protecting medical information about you. We maintain our records and conduct our treatment environment with a goal of providing the highest level of protection for your medical information, while still providing you with the highest level of medical care. This notices applies to all of the records of your medical care which are received or created by Robinson Facial Plastic Surgery. 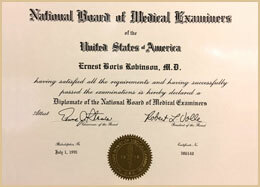 This notice will tell you about the ways in which Robinson Facial Plastic Surgery may use and disclose medical information about you. Your medical information, also referred to as "protected health information" is that information about you, including demographic information, that may identify you and that relates to your past, present or future physical or mental health information and related health care services. By becoming a patient at Robinson Facial Plastic Surgery, you are giving consent for Robinson Facial Plastic Surgery to use your protected health information for certain activities, including treatment, payment and other health care operations. Sometimes, you may hear these three activities referred to as "TPO". First of all, we may use and disclose protected health information about you so that Robinson Facial Plastic Surgery and its medical professionals can treat you. For example, we may use your past medical information in order to diagnose your present condition or we may provide information regarding your medical condition to another doctor to whom we refer you for additional care. We may also use and disclose protected health information about you so that we may be paid for the medical treatment we provide you. For example, we will submit protected health information about you to your insurance company in order to receive payment for services we have provided to you. We may also use and disclose protected health information about you for Robinson Facial Plastic Surgery's health care operations, in other words, those other tasks that we need to perform to make sure that you are provided the highest quality of medical care. For example, we may use your protected health information to evaluate how we can better meet your needs or we may provide protected health information about you to an auditor who reviews our books so that we can keep our license to provide medical services in California. The following uses of your protected health information may be made without any additional authorization from you. 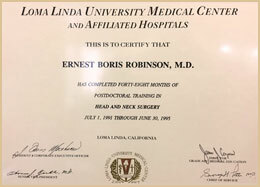 (Not every use or disclosure is listed, but be assured that all uses and disclosures made by Robinson Facial Plastic Surgery are only those which are permitted under the law). We may use and disclose your medical information to contact you as a reminder that you have an appointment at the office. If you request that such communications be made confidentially, please contact our office in writing at 24541 Pacific Park Drive Suite 103,, Aliso Viejo, CA 92656, USA. We will accommodate all reasonable requests. From time to time, Robinson Facial Plastic Surgery may use and disclosure protected health information to tell you about certain health related benefits or services that may be of interest to you. You also have the right to request to receive private health information communications (such as appointment confirmations) by alternative means or at alternative locations. For example, you can ask that we only contact you at work or by mail. To request confidential communications, you must make your request in writing to 24541 Pacific Park Drive Suite 103,, Aliso Viejo, CA 92656, USA. We will not ask you the reason for your request. We will accommodate all reasonable requests. Your request must specify how or where you wish to be contacted. If you feel that the protected health information we have about you is incorrect or incomplete, you have the right to request that your protected health information be amended. Only the health care entity (e.g., doctor, hospital, clinic, etc.) that created your protected health information is responsible for amending it. For more information regarding the procedures for submitting such a request, contact 24541 Pacific Park Drive Suite 103,, Aliso Viejo, CA 92656, USA. You have a right to an accounting of disclosures of your protected health information, for purposes other than treatment, payment or health care operations by Robinson Facial Plastic Surgery or any of the people or companies who perform treatment, payment or health care operations on our behalf. To request this list of disclosures we made of protected health information about you, you must submit a request in writing to 24541 Pacific Park Drive Suite 103,, Aliso Viejo, CA 92656, USA. Your request must state a time period which may not be longer than six (6) years prior to the date of your request and may not include dates before August 1, 2005. Your request should indicate the form in which you want the list (for example, on paper or electronically). You will be charged for photocopying. 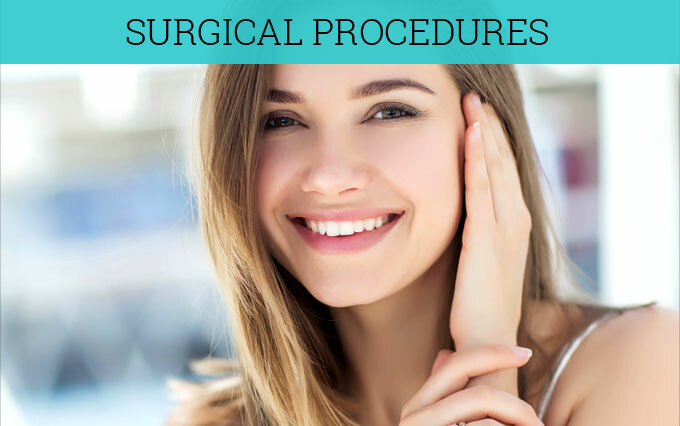 To learn more about these procedures, or to make any of these requests, you should contact our Office Manager at (949) 831- 5900. Robinson Facial Plastic Surgery reserves the right to change this notice. We reserve the right to make the revised or changed Notice effective for protected health information we already have about you, as well as any information we create or receive in the future. 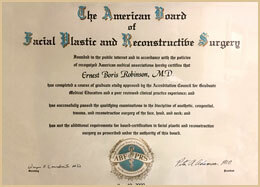 We will post a copy of the current Notice on Robinson Facial Plastic Surgery website: http://www.drface.com. The Notice will contain, in the top right-hand corner, the effective date. 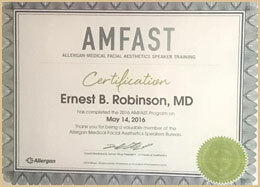 If you believe your privacy rights have been violated and/or that Robinson Facial Plastic Surgery or Dr. Ernest Robinson has not followed this policy, you may file a complaint with Dr. Ernest Robinson Office Manager or with the Secretary of the Department of Health and Human Services. 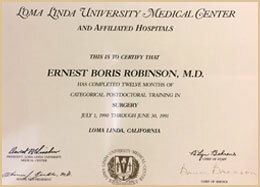 To file a complaint with Dr. Ernest Robinson contact Office Manager, 24541 Pacific Park Drive Suite 103,, Aliso Viejo, CA 92656, USA. All complaints must be submitted in writing. You will not be penalized for filing a complaint. 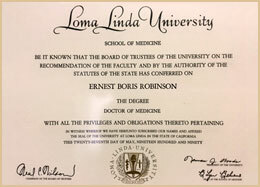 Other uses and disclosures of your protected health information not covered by this notice or the laws that apply to Dr. Ernest Robinson will be made only with your written permission ("authorization"). If you provide us permission to use or disclose protected health information about you, you may revoke that permission, in writing, at any time. If you revoke your permission, we will no longer use or disclose protected health information about you for the reasons covered by your authorization. You understand that we are unable to take back any disclosures we have already made with your permission, and that we are required to retain our records of the medical treatment or other services that we have provided to you. If you have any questions regarding this notice, please contact the Office Manager at Robinson Facial Plastic Surgery.